The start of the erection of the metalwork. 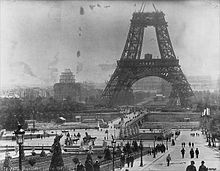 7 December 1887: Construction of the legs with scaffolding. 20 March 1888: Completion of the first level. 15 May 1888: Start of construction on the second stage. 21 August 1888: Completion of the second level. 26 December 1888: Construction of the upper stage. 15 March 1889: Construction of the cupola. ↑ Wulf, Theodor. Physikalische Zeitschrift, contains results of the four-day long observation done by Theodor Wulf while at the top of the Eiffel Tower in 1910. ↑ "A Bonanza in Paris"
↑ "Extreme bid to stretch bungy record - World"
↑ Porter, Darwin; Prince, D; McDonald, G; Mastrini, H; Marker, S; Princz, A; Bánfalvy, C; Kutor, A; Lakos, N (2006).